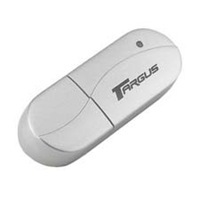 The Targus Bluetooth USB Adapter provides Bluetooth compatibility to your existing USB desktop environment, or Laptop, enabling you to work with all devices enabled with Bluetooth technology. Supporting the latest Version 2.0 specification, it offers transfer rates up to 3 times faster then its predecessor, enabling you to transfer files and data between devices, synchronize contacts and calendar information with your PDA and Smart phone, wirelessly print and even connect to the internet or a network via your mobile phone quicker then before. Capable of operating within a range of up to 10m, you can now connect to multiple Bluetooth enabled devices, such as a keyboard, mouse and printer to create a truly wire-free environment. With the boundaries of wireless applications being stretched on a daily basis, let Targus help you get the most from your personal area network.